Complete symphonies, 1-6 / Carl Vine. 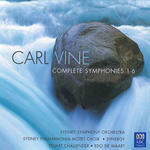 Three symphonies / Carl Vine ; Sydney Symphony Orchestra, Stuart Challender. Instrumentation: Piccolo, 3 flutes (2 alto flutes), 3 oboes, cor anglais, 3 clarinets, bass clarinet, 3 bassoons, contrabassoon, 6 horns, 4 trumpets, 3 trombones, bass trombone, tuba, timpani, 3 percussion, celesta, 2 harps, strings. Commission note: Commissioned with funds provided by Australia Council. Performing Arts Board.. This work was the John Bishop Commission for 1990, administered by the Elder Conservatorium at the University of Adelaide. Program note: Carl Vine's "Symphony No. 3"
5 Mar 90: Adelaide Festival Theatre. Featuring Sydney Symphony, Stuart Challender.